So you're ready to make a purchase from PaulsTV, just click a PaulsTV coupon codes provided here, and copy it. After that, just paste the code into the coupon box during checkout, your discount should appear automatically. With GetDiscountCoupon.com, you'll find only the latest paulstv.com discount coupons. See what Online Specials we have at PaulsTV.com and SAVE! Get the Samsung UN60F8000 for just $2897.99 Plus Get a Galaxy Tab2 7.0, Free White Glove Delivery & No Sales Tax and Free 2 year Warranty. Get the Yamaha YAS201 for only $319.99 Plus get Free Shipping and No Sales Tax. Get your Home Theater Receiver from PaulsTV and SAVE! Get your Electronics Stand at PaulsTV.com and SAVE! Get 40% OFF regularly priced Black 65 Innovex TV Stand Plus No Tax and Free Shipping. No Coupon Needed. Get the Samsung UN55F6400 for just $1399.99 plus get Free Shipping and No Sales Tax and Free 2 year Warranty. Get the LC70LE650U for just $1999.99 plus get Free Shipping and No Sales Tax. Get the AVR1513 5.1 Channel 3D Pass Through Home Theater Receiver for just $212.49 Plus Get Free Shipping and No Sales Tax [except CA, CO, MA, MI, RI] . Save an additional $30 on the LG 50LN5700 50" 120Hz Full HD 1080p Smart LED TV plus get Free Shipping and No Sales Tax. Get the Toshiba 50L1350U 50" 120Hz 1080p LED HDTV For $749.99 Plus get Free Shipping and No Sales Tax. Get Free Shipping PLUS We'll Pay the Tax! Some Exclusions Apply. See Website for Details. Purchase A Samsung UN55ES7500 for just $1499.99 Plus Get Free Shipping and No Sales Tax [except CA, CO, MA, MI, RI]. While Supplies Last. SAVE Big on HDTVs, Home Theater Systems, Audio, Tablets, Blu-Ray Players and more at Paul's TV! Click Here to see all the Clearance Deals. Get the Sharp LC60LE757U for just $1899.99 plus get White Glove Delivery and No Sales Tax. Purchase a Samsung UN60ES7500 for just $1799.99 and get $250 in Gift Cards PLUS get Free Shipping and no Sales Tax [except CA, CO, MA, MI, RI]. Save an extra $80 on the TCP60ST60. Free Touch Pen By Mail in Rebate, Free $250 in GCs, Free 2 Yr Warr, Free Shipping. No Sales Tax. Reg Price $1499.99. Water Coolers & Beverage Dispensers are now Available at PaulsTV. Free Shipping. Coffee Makers are now Available at PaulsTV. Free Shipping. Get your Blu-Ray Player at PaulsTV.com and SAVE. Get your DVD Player at PaulsTV.com and SAVE! Get your LED Television from PaulsTV and SAVE! 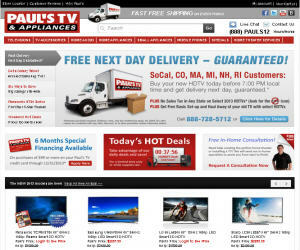 Get your TV Mount at PaulsTV and SAVE! Miscellaneous Appliances are now Available at PaulsTV. Free Shipping. Wine Refrigerators & Accessories are now Available at PaulsTV. Free Shipping. Get all your Audio Components at PaulsTV.com and SAVE! Bread Makers are now Available at PaulsTV. Free Shipping. Rice Cookers & Steamers are now Available at PaulsTV. Free Shipping. Get your favorite Electronics Accessory at PaulsTV.com and SAVE! WD73642 Bundled with a Black65 TV Stand and $250 in GCs and a $200 Restaurant.com GC for only $1249.99. Free White Glove Delivery and No Sales Tax. Get your DLP Television at PaulsTV and SAVE! Get Power Protection for all your TV and Electronics at PaulsTV and SAVE! Toasters & Toaster Ovens are now Available at PaulsTV. Free Shipping. Small Appliances are now Available at PaulsTV. Free Shipping. Catch all the latest coupons and promotions from PaulsTV. Get your Plasma TV at PaulsTV and SAVE! Deep Fryers & Roasters are now Available at PaulsTV. Free Shipping. Ice Cream & Yogurt Makers are now Available at PaulsTV. Free Shipping. Blenders, Mixers & Food Processors are now Available at PaulsTV. Free Shipping. Grills - Electric & Fondue are now Available at PaulsTV. Free Shipping. Mobile Phones and Service Plans are now Available at PaulsTV. Free Shipping. Never miss coupons from PaulsTV! Enter your email below and we will send you the latest and greatest PaulsTV deals. Best place to search for TVs, Home Audio and Home Theaters online. Lowest price and free shipping. We'll match any authorized competitor, including online retailers. Paul's TV is proud to sell Mitsubishi, Panasonic, Samsung, Sharp, Toshiba, LG. Paul founded Paul's TV almost 50 years ago with a $1000 loan from a relative. Working out of one small store in La Habra, CA, Paul's TV changed forever in 1978 with the introduction of the Big Screen TV. Paul's TV now has locations in Southern California, Colorado, New England, and Michigan. Our seven California / New England superstores coupled with our stores inside Living Spaces, Furniture Row, Jordan's Furniture, and Art Van Furniture make Paul's TV the ideal place to purchase your new big screen television. Since we specialize in televisions, we truly are the "King of Big Screen." Shop online or visit any of our stores to talk with our courteous and knowledgeable sales professionals about your new television purchase. Find out about the "Royal Treatment," our 30 Day Price Guarantee, and learn why Paul's TV is truly "The King of Big Screen." Once you have find the available Paulstv.com promo code, choose the best Paulstv.com code according to your needs because you can have multiple promo codes for Paulstv.com. You should check any restrictions and policies before applying coupon, such as expiration date, because some coupons are valid for very short period, So if you need a Latest Paulstv.com Promo Coupon / promotion code please BOOKMARK US (Ctrl + D) and check this site frequently. And one important thing some coupon codes are case-sensitive.